I'm not a big Tina Fey fan. This is not to say I dislike Ms. Fey, or her former SNL cohort Amy Poehler, but when trailers promoting this 21st century take on The Odd Couple came out, I wasn't rushing to mark the opening down on my calendar. That said, Fey and Poehler's chemistry in Baby Mama is a beautiful thing to watch. Poehler especially does a great job giving humanity to her character which could have easily been a caricature white trash bimbo. At times her physical comedy and facial expressions were reminiscent of the late, great Lucille Ball. On a scale of funniness, Baby Mama doesn't score as high as last year's big pregnancy movie, Knocked Up. But I found it to be more amusing than Apatow's latest offering, Forgetting Sarah Marshall. 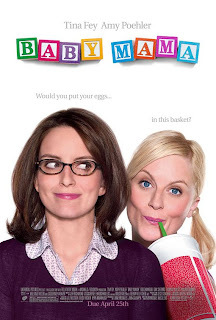 But beyond the obvious shtick and pratfalls revolving around Poehler's childish "Oscar Madison" (aka Angie) acting as a surrogate for Fey's uptight, neurotic "Felix Unger" (aka Kate), Baby Mama throws a few intriguing plot twists into the story as well. It does, however, have your typical predictable happily ever after ending--but it's a comedy for pete's sake! We're supposed to walk out of the theater feeling happy! The best thing about Baby Mama wasn't even the super, natural interplay of its two stars, but the fantastic supporting cast. Steve Martin playing Fey's hippy-dippy boss? Genius. Martin brought the perfect amount of unctuousness to the role of Barry, who gives his employees with "five minutes of uninterrupted eye contact" as a reward. Sigourney Weaver as an inconceivably fertile Gestational Placement Agency Director and the ever reliable Holland Taylor as Fey's own "Mommie Dearest" are effortlessly funny. Even Dax Shepard is a hoot as Poehler's deadbeat, dimwit boyfriend. But the piece de resistance was casting Greg Kinnear as Fey's love interest, Rob, owner of a small independent smoothie shop fighting the corporate juice pimps of Jamba Juice to stay alive. Kinnear, who has always been solid and likable performer, is witty and charming and so damn HOT! What a total cutie. The scenes between him and Tina Fey just sparkled. The funny lines and moments are pretty much all in the trailer and yet Baby Mama was still a satisfying experience. It's not a gut-busting, laugh so hard it hurts kind of movie--it's more subtly amusing most of the time. But whether it's the love story between Kate and Rob, or the love story between Kate and Angie, this is a movie with heart. And I think that more than the silliness and slapstick is what made it worth the price of admission for me.